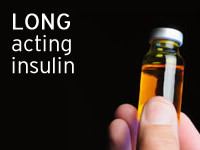 Long acting insulin may be prescribed for a number of different types of diabetes. Long acting insulins are available in animal and analogue forms. Their activity can last up to 24 hours with the exception of bovine PZI. Bovine PZI (protamine zinc insulin), can last anywhere up to 36 hours. Long acting analogue insulins have been favoured by the NHS because the insulins have no peak activity as such, which allows for a consistent delivery of activity through the day. However, as with any form of insulin, hypoglycemia is a common side effect which one should be wary of. How often should long acting insulins be injected? Long acting insulins will be injected either once or twice daily. The medical name for Lantus is insulin glargine. Lantus is an analogue insulin produced by Sanofi-Aventis. It has a consistent activity from within an hour after injecting up to 24 hours. Lantus can is usually injected once daily but may be injected twice daily if advised by your health team. Levemir is the brand name of insulin determir. Produced by Novo Nordisk, Levemir is an analogue insulin with a consistent activity similar to Lantus. The duration of Levemir is slightly shorter than Lantus and therefore it is often injected twice rather once daily. However, some people may only need one daily injection. Tresiba is the brand name for insulin degludec, an ultra-long acting insulin produced by Novo Nordisk. Tresiba can be taken by people with type 1 or type 2 diabetes once per day. Tresiba has a duration of more than 42 hours and has been in clinical trials to reduce the rate of hypoglycemia compared to other long acting insulin. An advantage of the long duration of Tresiba is that it offers more flexibility in terms of injection timings. Hypurin bovine lente is a long acting animal insulin produced by Wockhardt UK Ltd. Bovine Lente, a beef insulin, starts to work shortly after injecting and has its peak activity 6 to 10 hours after injecting, and then tails off over the next 12 to 16 hours. Hypurin bovine protamin zinc insulin is also a beef insulin and is produced by Wockhardt UK. Bovine PZI is different to many insulins as it has a very late onset, starting between 4 to 6 hours after injecting. The peak activity kicks in between 10 and 20 hours after injecting and its duration of activity can last up to 36 hours after injecting.